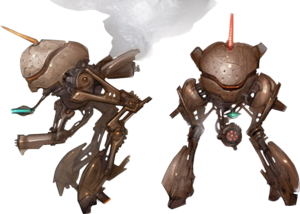 The Defense Drone is a boss from Metroid Prime 3: Corruption. It resides in the Ballista Storage room, where it guards the Boost Ball. The Elysian was a creation of the Chozo, possibly with guarding the Boost Ball as its only directive. When Samus steps into the Ballista Storage room and approaches the Boost Ball, an ornate cage closes around her and lowers her into the main portion of the room, where the Defense Drone resides. The Defense Drone attacks by shooting missiles, by firing a large ball of plasma, and by jumping to create a shockwave. Samus must damage it by shooting one of its three antennae on its head. After enough shots to each antenna, it will retract into the Drone's head. Samus must shoot all three antennae down, stunning the Drone. If Samus takes too long to shoot an antenna while another is down, the damaged antenna will return at full health. After the Drone is stunned, Samus must use her Grapple Lasso to open its head, revealing its now vulnerable core. The Drone will then leap between four platforms around the room, attacking Samus by firing bombs that slowly home in on her. Samus must fire Ice Missiles or Hyper Beam attacks at its core to damage it critically. The Drone's head shielding will periodically cover the core, preventing it from suffering damage. After a period of time, the core will fully regain its shielding, and the antennae regenerate, forcing Samus to disable the Core's defenses once again. As the Defense Drone nears death, the room will fill with dense smoke, making visual contact difficult and also more difficult to dodge the homing bombs. Eventually, after much damage, the Drone is defeated, leaving the Boost Ball behind. Despite defending the Boost Ball, it shows no ability resembling it like many other bosses. Curiously, the Defense Drone shows no signs of Phazon Corruption yet continues to attack Samus, despite it being a Chozo mechanism. Considering the Defense Drone wasn't corrupted or destroyed, the room may not have been explored by Space Pirates. The Defense Drone is used to secure key areas within SkyTown. The externally mounted antennas are tied into the unit’s optic array. By destroying all of the antennas, the optic array will overload and be vulnerable for a short period. The machine’s Control Unit is also vulnerable, but must be exposed to be targeted. Its armor is immune to small-arms fire. This page was last edited on 12 July 2013, at 04:39.